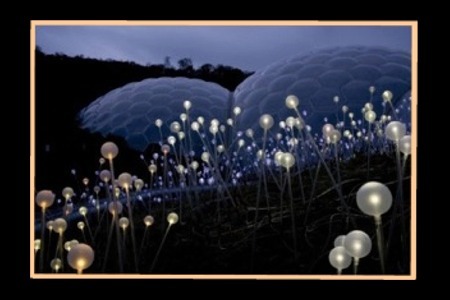 Inspired by the beautiful displays of flowers that spring up in Australia's desert landscape, UK-based lighting designer Bruce Munro created this amazing fiber optic Field of Light installation at the Eden Project in Cornwall. 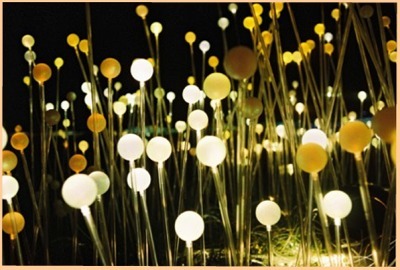 Field of Light was originally conceived fifteen years ago, when Bruce Munro took a trip through central Australia. The red desert had an incredible feeling of energy; ideas seemed to radiate from it along with the heat. 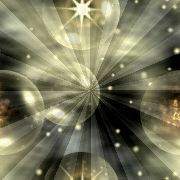 The field of light installation was one idea that landed in Bruce’s sketch book and refused to dislodge from his mind. 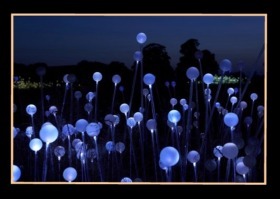 Field of Light can be seen at the Eden Project in Cornwall from 1st November 2008 - 31st March 2009. Bruce Munro and five assistants worked over three days to install it on the grass roof of the visitor’s centre, between the Rainforest and Mediterranean Biomes. 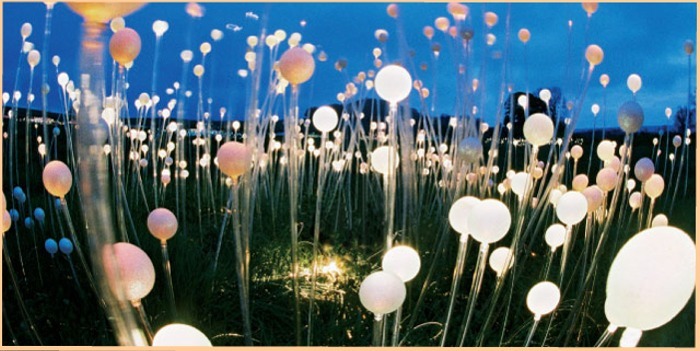 It is made of 6,000 acrylic stems, through which fibre optic cables run, each crowned with a clear glass sphere. There are 11 external projectors; the stems themselves hold no electric power at all. The installation covers an area of 60 x 20 meters, using 24, 000 meters of fibre optic cable. It’s best viewed after dark. 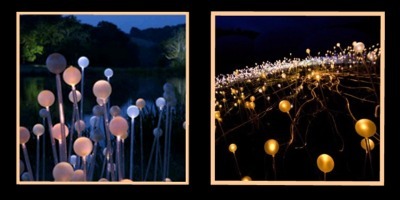 Field of Light has also been exhibited at the V&A museum in London, and under the shadow of an ancient hill in southwest England, in a field of clover bisected by a public footpath. By placing an alien installation in the midst of nature, the enormous contrast created allows one to literally see the wood from the trees. Under the shadow of an ancient hill in southwest England, in a field of clover bisected by a public footpath, the field of light shimmered through seasons and presented a myriad of opportunities for passersby to catch glimpses of nature's guises.